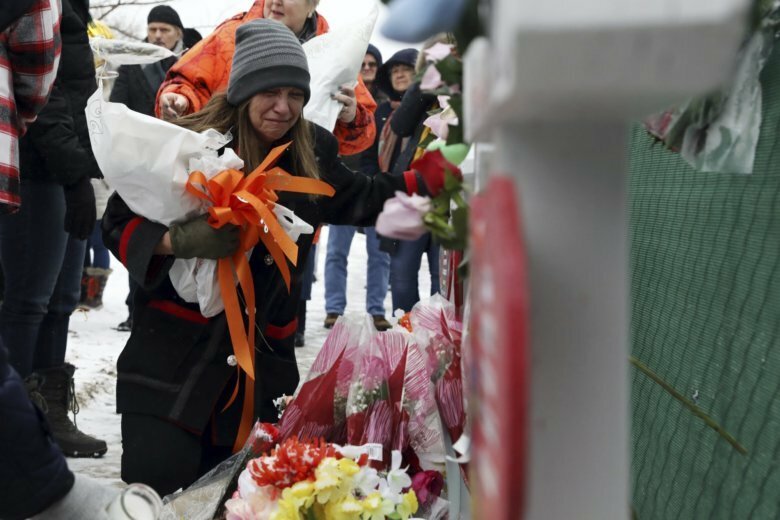 AURORA, Ill. (AP) — More than 1,500 people braved snow and freezing drizzle to attend a prayer vigil for five slain co-workers Sunday, two days after they were fatally shot at a suburban Chicago manufacturing plant by a longtime employee who was fired moments earlier. The Rev. Dan Haas told those who gathered near five white crosses erected for the shooting victims outside Henry Pratt Co. in Aurora that Friday’s “senseless killings” left their families brokenhearted in the city about 40 miles (65 kilometers) west of Chicago. “All of these were relatively young people — many of them were very young people. We will never know their gifts and talents. Their lives were snuffed out way too short,” he said of the victims, who included a 21-year-old university student on his first day as an intern. Haas called on God to bring comfort to the families and Aurora. He then read the names and ages of the five shooting victims, prompting waves of sobs and cries from relatives attending the vigil. The city of Aurora tweeted that about 1,700 people attended the vigil in a snowy lot outside the industrial valve manufacturer where several ministers and a rabbi called for healing. Authorities said Gary Martin pulled out a gun and began shooting right after hearing that he was being fired from his job of 15 years at the plant for various workplace violations. Martin, 45, was killed in a shootout with officers, ending his deadly rampage. Five police officers and a sixth plant worker were injured in the shooting and are expected to survive.